From mod folk artist to flower power pixie elfin to the king of glam rockers, Marc Bolan was the ultimate chameleon. His far reaching musical and stylistic influence is more relevant today than ever with hits such as ‘Ride A White Swan’, ‘Children Of The Revolution’, ‘Get It On’ and ‘Hot Love’ as fresh and exhilarating as when first released. At the peak of his popularity during his lifetime Bolan was outselling Jimi Hendrix and The Who, and yet relatively little is really known about the hypnotic, enigmatic 20th century boy turned 21st century icon. At last, in the 35th anniversary year of his tragic death, Marc Bolan represents the definite biography. Here rock biographer, Lesley-Ann Jones, paints a meticulous portrait of the T-Rex front man. From his childhood growing up in Hackney to his untimely death at the age of 29, Bolan’s life was one of relentless experimentation and metamorphoses. Hallucinogenic drugs, wizardry and levitation, alcoholism, tax evasion and a spectacular fall from grace were to punctuate his short life, as he continued to strive to reinvent himself and his music over and over again. Lesley-Ann has been granted access to those who knew Bolan best, including his partner and the mother of his only son, Gloria Jones and his brother, Harry Field. 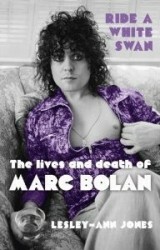 this is "THE" Marc Bolan biography . . . balanced rather than sensationalist, something the Bolan fan base will appreciate. Lesley-Ann Jones brings my old friend almost back to life in this brilliantly observed and detailed account of a fascinating man who lived an all-too-short life. The first book to show us the real Marc. Important missing pieces of the complicated short life that was Marc Bolan's. It is a sensational read.